Nissan currently has a full lineup of crossovers and SUVs, but none of them feature a hybrid powertrain. This could all change very soon, however – Nissan just unveiled its Hi-Cross Concept at the 2012 Geneva Motor Show, and this cool new car is designed to be powered by a hybrid system. 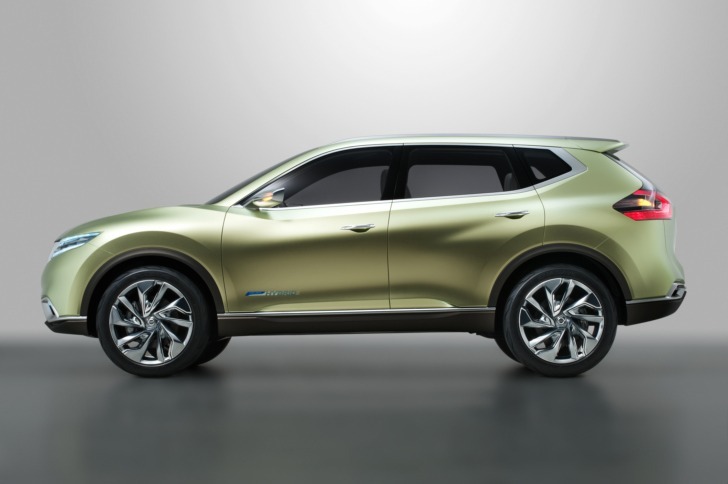 Word on the street is that the new vehicle could be Nissan’s next crossover to go into production. The Hi-Cross Concept is a compact crossover that has room for up to seven passengers. It’s powered by a hybrid system that couples an electric motor with a 2.0L direct-injection gas engine and a lithium-ion battery. The hybrid system is based on new technology developed by Nissan for front-wheel drive models, but modified to provide four-wheel drive. The new system’s “one-motor, two clutch” technology is also mated to Nissan’s new generation XTRONIC continuously variable transmission that also yields a 10 percent improvement in fuel economy over previous generation CVTs. The system also uses the battery technology that was developed for the Nissan Leaf EV. In city driving, the electric motor and lithium-ion battery allow the engine to be turned off frequently. It can also be disengaged completely with the clutch, and energy can be recovered effectively when braking. According to Nissan, the entire system has the performance potential of a larger 2.5L engine with better fuel economy and emissions. François Bancon, Deputy Division General Manager of Product Strategy and Product Planning Division, said: “Although this is purely a concept car, exploring potential ideas for the future, there is no ambiguity about its purpose. It is a high-riding crossover, hence its name: Hi-Cross Concept. Nissan currently has a full lineup of crossovers and SUVs, but none of them feature a hybrid powertrain. This could all change very soon, however - Nissan just unveiled its Hi-Cross Concept at the 2012 Geneva Motor Show, and this cool new car is designed to be powered by a hybrid system. Word on the street is that the new vehicle could be Nissan's next crossover to go into production.